In this big online retail world, we're faced with tons and tons of home décor stores of different kinds. Every one of them promises us the best shopping experience and the greatest products. But not all the stores are equal! Here is the list of my trusted online home decor shops. I shop there for myself and for my clients AND these are the shops I specify items from for my eDesign - online interior design projects. Best part here – all the stores operate and ship from Canada, so you won't spend extra on custom duties - hooray! Less money spent on customs means more cute room accessories! I probably don’t have to tell you again how I love IKEA for its versatility, comfortable beauty, and affordability. Check out IKEA’s NEW 2018 Catalog - there are some real deals and swoon-worthy furnishings! This truly Canadian home decor shop has been operated since 1970. You can always find stylish and fashionable furnishings and accessories to suit all your decor needs here. Shop here for soft linen bedding, cool window treatments, plush bathroom essentials, and simple yet stylish tableware for every occasion. They offer a distinct European vibe and ultimate comfort. This is one of my favourite online décor shops. Nordic simplicity and fashionable interiors? Yes please. H&M brands are united by a passion for fashion and quality and the drive to furnish customer’s homes in a sustainable way. 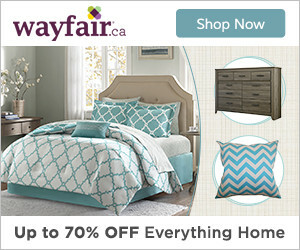 It's no secret that Wayfair is gaining extreme popularity among online home décor retailers - and for good reason! They have a huge variety of products for any style and preferences to fit any budget. 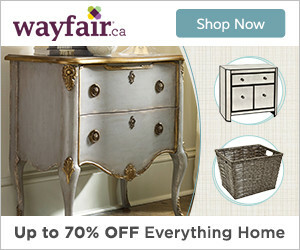 “Wayfair helps people find the perfect product at the right price." Here's another Canadian fashion retailer serving Canadians from 1840! Simons Maison is uniquely different and inspiringly fashionable. Their unique home decor and accessories selection will make all your non-Canadian friends jealous. A huge online resource for anything you might need, Amazon has almost everything you might think of for your home. Amazon Prime membership's fast delivery makes it perfect for those who needs it right here, right now! This is Mid-century modern heaven! “Design is about more than just beautiful furniture. It’s about how it influences our life, shape our home, and inspires stories.” You’ll find the most iconic pieces of modern furniture designs here. I want every piece from that store! Mobilia is the first furniture retailer to introduce European pieces into Canada on a large scale - over 50 years ago! They bring an incredible range of new and exciting home furnishings, huge variety and exceptional customer service. EQ3 designs, produces and sells affordable, modern furniture for every room in your home. Modern designs for everyday living. They strive to produce as many products in Canada as possible. And the furniture is beautiful! Take a look! Talk about a huge resource for all your décor needs. The vision of the company is to bring unique home furnishings from around the world and offer them in one location. The history of the company begins in 1944, and till our day amazes us with the best products! ELTE MKT has a vast showroom and we are so lucky to shop the online store, too. This is a furniture and home décor destination where you get a little more than what you'd expect and you can discover what makes a home just right. Yes, that’s true. Modern furniture, affordable prices and everything just right. Furniture.ca is a proudly Canadian company and more than just an online furniture store. They handpick unique pieces and Canadians will find everything they are looking for and more from the comfort of their your own home. Surprised? Yes, me too! BestBuy is now selling not just appliances and electronics, it's a convenient one-stop-online-shop for all you home needs, including furniture, accessories, and even baby items. And of course - every designer's dream Samsung the Frame TV is there! Designed for your space the Frame is an innovative design concept that exudes elegance as a framed piece of art and a 4K television. It beautifies any space in your home, adding personality to a room by displaying art and your own photos. There is one more store here in Canada that I wish someday could offer online shopping. I go there constantly, not even buying anything. Well, it IS conveniently located just across from my go-to coffee shop. This store is one of my favourite destinations to find inspiration, to source for unique accessories and furnishings, and it offers the best prices. Heading there right now! Can you guess which store it is? Hi, Sofia is here. This Interior Design Blog is full of decor love and interior design magic. Here I share everything that inspires me in my interior design work and in the everyday life. I share my styling secrets and professional design advice. I'm so happy you are here! The List is on the way! Please check your email to confirm subscription. © 2018 Sofia Sakare Interior Design. All rights reserved.